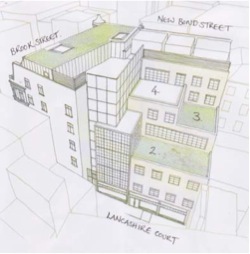 Verde Garden Design was delighted to be asked to design three roof terraces, in collaboration with Chapman Workhouse Architects, on three levels of Victoria’s Secret’s new European Headquarters in New Bond Street, London W1. The project started for us in January 2011 and finished on site, after an enormous building programme, in July 2012. We worked with Chapman Workhouse Architects, Faithdean Construction and Pierra Restoration Stonework. Our client was Les Wexner, Founder of Victoria’s Secret and his Vice President, Kathleen Baldwin. 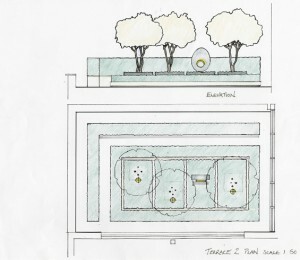 To design a scheme that was in-keeping with the designated conservation area. 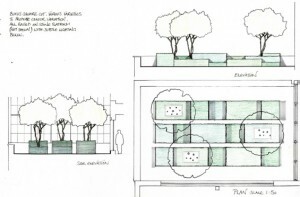 Westminster City Council asked for a ‘greening of the terraces’ and as such we designed roof terraces to fit their purpose, rather than green roof to improving the overall energy efficiency of the building. The scheme had to enhance and preserve the character of the immediate vicinity. It had to strengthen the biodiversity of the locality. It needed to be a unified scheme, throughout the terraces. Planting had to be low maintenance, but not ‘no maintenance’. Rainwater harvesting was to be investigated by the architects and the scheme had to be flexible enough to allow for this, if chosen. 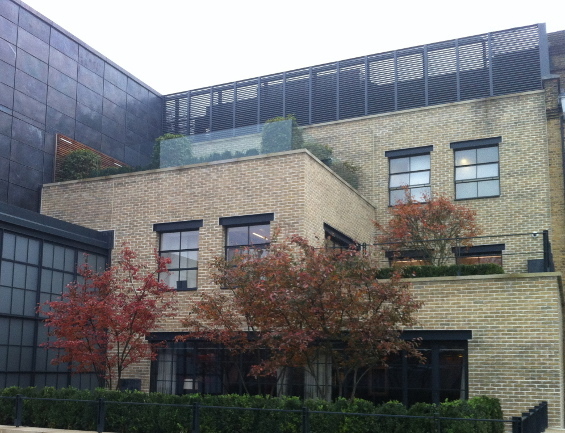 The terrace on the fourth floor was an area of relaxation for staff and for the occasional group staff meeting. We suggested we add as much greenery as possible, to offer a calming retreat in its truly urban position, while remembering that it occasionally had to accommodate all staff, at one time.The largest terrace was on the second floor. Les Wexner, took a personal interest in the design of this area, as it would be viewed from the VIP changing rooms. He was keen for it to add to the shopping experience of some of his best customers. The design: We started with the fourth floor, as the architects needed information about heights of handrails and the layout. We were keen to incorporate the corporate colour (pink!) in some way on this floor; in the visual opposite, we explored the use of cube benches made from pink resin. 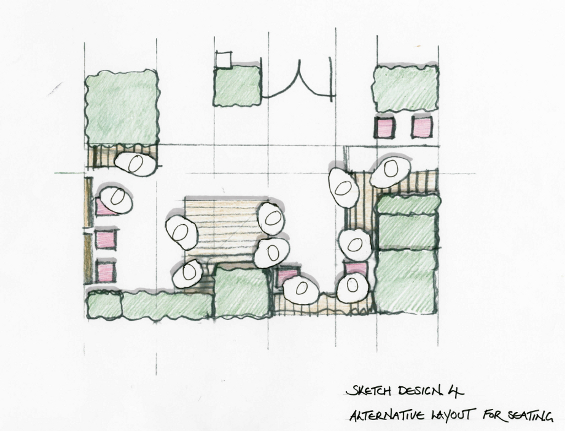 Our initial ideas for ‘grouped meeting areas’ within the terrace layout, were amended in favour of simple perimeter seating, that would allow the maximum flexibility for large staff gatherings. 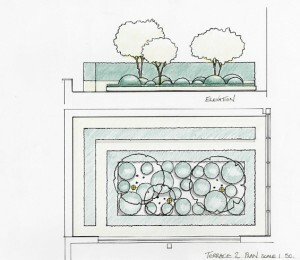 We looked at the design of terrace 2 and 3 together. The idea being that whatever we designed for terrace 2 would also need to work for terrace 3 in some way, as they would be seen together. Privacy was the big issue here. Les Wexner was determined that the changing rooms would not be viewed from other buildings. The terrace had the potential, at this time, of being viewed from two sides. Our first visual played with the use of trees to mask the view into the changing rooms, from key points. The second and third visual introduced a hedge as well as trees, at Les’s request. Visual 3 was the chosen scheme, for ease of maintenance. We added interesting lighting and stone plinths to complete the look. Now we just had to work out how to build it! Presenting our ideas to Les Wexner, one of the most successful men in America, is an experience we will never forget! from everygreen varieties to allow the maximum light into the building in the winter months). Our fantastic contact at Deepdale trees, Mark Godden, took our dimensions and flew to Germany to choose us four, 20 year old, umbrella clipped specimens that matched our visuals exactly in shape and size. Buxus sempervirens (Box), with its evergreen interest and resilient qualities was our next choice, coupled with columns of Carpinus betulus (Hornbeam) to give structure and privacy to the seating areas on the staff terrace. 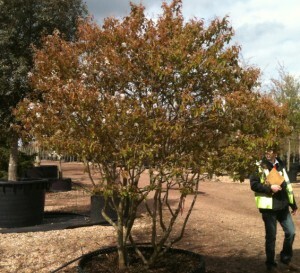 All of the trees and columns were ordered and inspected by us during September, to ensure we had exactly what we needed for our planting date of late January. The buxus came from Holland through ‘James Chichester Trees and Shrubs’. We have worked with James many times before and as always, he pulled out all the stops to ensure that we got the best quality Buxus on the market. It was lovely to have a site visit from Annie Chichester, James’s wife, while we were planting, just to check that all was going well! Detailing: Weight on the roof terraces, was the important issue. The trees were over 3m tall so it was no mean task finding a way of introducing enough soil to allow the trees to thrive, and accommodating the associated weight. 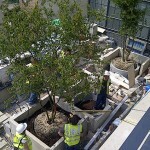 We had also decided that the plinth that the planting would sit on, should be stone. I am very glad to say that at this point, Chapman Workhouse Architects stepped in to take over this tricky task. The build: Our terraces were part of a 40,386 square foot retail refurbishment designed by Chapman Workhouse, in New Bond Street. As with any large retail contract, towards the end of the job the site is manic with builders pulling out the stops, to get the job done on time. This was were we started on site! The enormous crane, that would lift our trees straight over the 4 story building, from New Bond Street, to Lancashire Court, was about to disappear from site. We had to move fast! We were programmed-in to be on site on two days, before the crane was due to be removed. We had everything crossed, in the hope that the wind conditions would be ok. The first day was too windy so the trees were actually moved on the last possible available day, which was more than a little hair-raising for us garden designers! 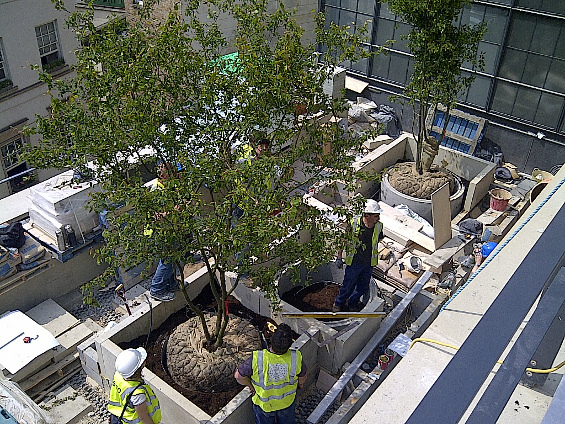 It was amazing to see the trees appearing over the top of the building, after so many months of planning. 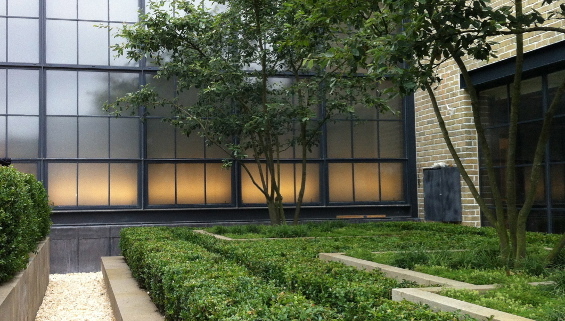 Once the trees where guyed in place, we were ready for the Buxus. 700 plants were delivered and left in New Bond Street, ready to be transported in wheelbarrows up to the various floors; no mean feat! The irrigation system’s final fix was completed after the Buxus was installed, to ensure we didn’t miss any of the know-to-be thirsty plants. The final planting was to add Thymus serpyllum’Snowdrift’ mixed with Ophiopogon japonicus ‘Nana’ in a random pattern at the base of the trees, with a lovely grey pebble filling the gap around the base of the fantasticly sculptural stems of the Amelanchier trees. Was the project successful? Victoria’s Secret has had an amazing response to the opening of their incredible new store, both from the press and from quantities of sales. Were our terraces a success? The email we had from Kathleen Baldwin, Vice President for store design, was enough for us to think it was! This entry was posted in Blog Posts. Bookmark the permalink. Both comments and trackbacks are currently closed.